You're in for a treat with this recipe for Berry Bounty Slices! These squares of indulgence my be perfectly sweet, creamy, rich and delicious but they're also 100% raw, vegan, gluten free and free from refined sugars....not that you'd believe it! 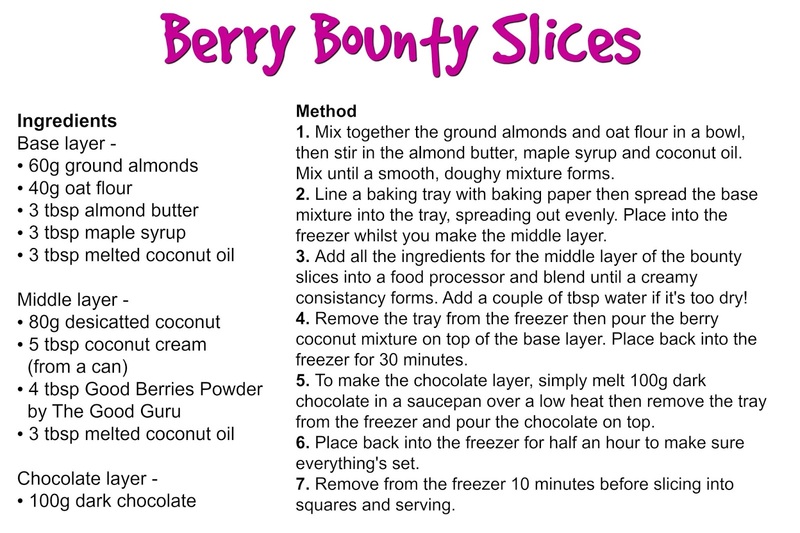 Bounty's are a classic, so I decided to put a Nourishing Amelia twist on the classic chocolate bar and make these Berry Bounty Slices complete with creamy coconut filling and dark chocolate topping. 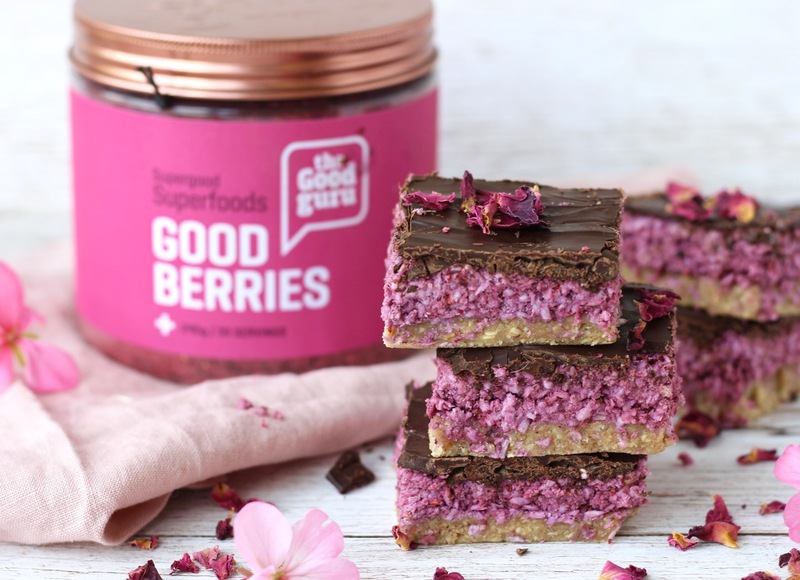 The star ingredient is the Good Berries powder from The Good Guru which not only makes these sweet treats look super pretty and bright but also adds a heavenly berry taste that pairs wonderfully with the coconut and chocolate. 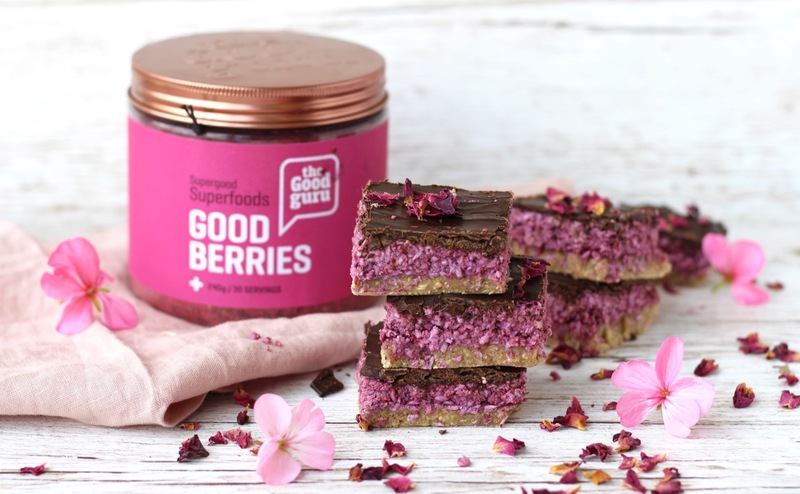 The base of these bounty slices is made from ground almonds and oats which creates an almost biscuity texture, then the middle is made from desiccated coconut and coconut cream as well as the Good Berries powder by The Good Guru which is a superfood berry blend made from blueberry, blackberry, cranberry, cranberry and raspberry freeze-dried powder - it's loaded with nutrients and antioxidants, tastes amazing and gives this beautiful pink colour! I then topped the bounty slices with all important dark chocolate. My Berry Bounty Slices make the best afternoon sweet treat with a cup of tea or an indulgent dessert after dinner. They're a real crowd-pleaser too, so try serving them up to a group of friends or taking them into work for your colleagues to munch on. They're best kept in the fridge in an airtight container and should be eaten within 4 days.